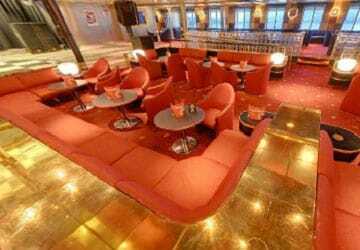 The Stena Saga cruiseferry promises to make the journey a memorable one with its array of onboard facilities including numerous bars, restaurants, free wifi, a shop and a wide choice of cabins. You'll also find numerous activities from live music and theme nights to fun activities for the kids. 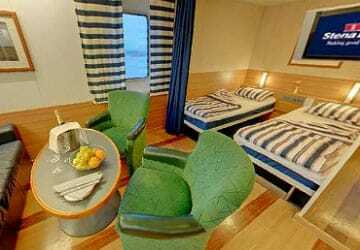 The ship contains numerous cabin types ranging from standard 2 berth cabins to captains suites. 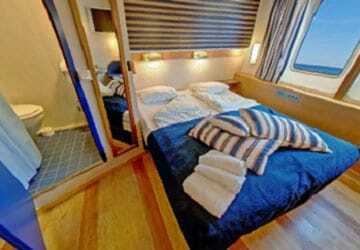 All cabins contain shower, toilet, bed linen and towels. The à la carte Metropolitan restaurant is an elegant environment where you can totally relax. Make your choice from the menu and the elaborate wine list while taking in the fabulous seaview. The buffet restaurant 'Taste' is the place to enjoy a wonderful breakfast in the morning while at night you can feast on the wide variety of dishes from the Scandinavian buffet. 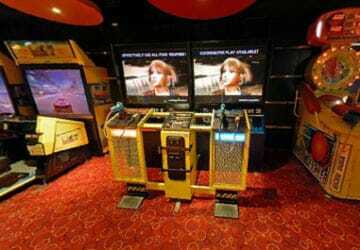 The C-View Showbar on deck 7 is sure to increase your heart beat. During the day it is just an oasis of serenity, at night it transforms and live Music is played. When you are not hungry but just want to enjoy a nice cup of coffee or a drink, the Riva bar is the place to be. The Forza bar is the place for sports lovers offering several kinds of coffee, snacks and an elaborate choice of alcoholic beverages in front of wide screen tv's. 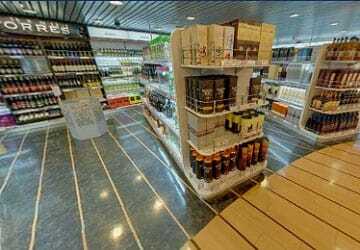 You can shop to your heart's content onboard the Stena Saga. There is something for everyone from lovely scents for both women and men to Irish whiskeys and other liquors. 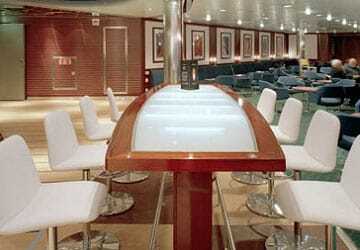 The disco/night club on deck 10 is the 'place to be' for people who like to party. 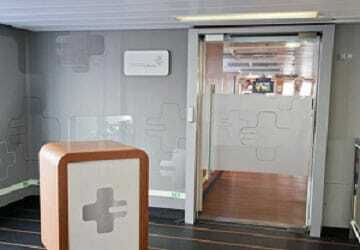 The Stena Saga has a beauty salon where you can treat yourself to a lovely massage or body wrap. Naturally, you can also get a manicure and pedicure. 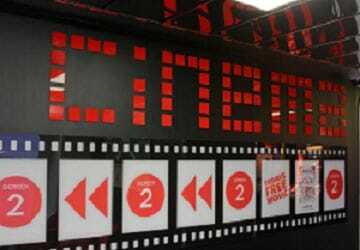 You can also watch the latest films in the cinema or try your luck in the onboard casino which features Roulette, Blackjack and Gaming machines. On deck 9 you will find 'Matrosland', a children's play area where children can play, watch a film and play with other passengers. There are play sets for children of all ages. There is also a kids club during peak holiday season. 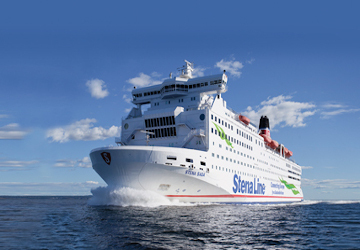 The Stena saga is wheelchair friendly and contains specially adapted cabins for disabled passengers. Please Note: Whilst we have taken great care in making our Stena Saga guide as accurate as possible, onboard facilities, services and entertainment may vary depending on the date and time of year that you travel, facilities mentioned may change without notification and ferry companies reserve the right to operate vessels other than those mentioned at time of booking without prior notification. 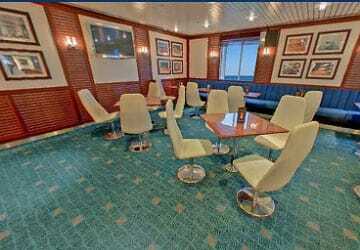 "oslo to frederikshavn Thursday october 27th"
"Generally good to have a trip with the huge boat." Staffs are very friendly. The Bay Looked So nice. All went as planned. Nice boat. Great boat, great views, great experience. Rusty spots on deck here and there. "A sunny and quiet travel"
It could have all been different. Arrived in plenty of time and a very pleasant young man did our paper work and directed is to lane 5, where we waited and followed everyone else on to the ferry. I wondered why the sign said Gothenburg when we were going to Oslo and queried it with the loaders and had to do a quick exit as we were on the wrong boat! The trip to Oslo was a 9 hour, smooth ride on good weather. The boat itself was clean and the staff spoke good English and were helpful and polite. I paid 36 pound for this crossing with my motorcycle, and for a 10 hour crossing this could be the cheapest mode of transport in the world! The crew were great and helpful, and due to the lovely weather everybody was on the sun deck listening to the live music that was being laid on for free. I think its fair to say that this was the most enjoyable and scenic (once you got in to the fjords) cruise, sorry, I mean ferry that I have been on! Well worth the money. Oslo - Fredrikshavn - Oslo was for me first and foremost just a means of transportation (round trip Århus was my goal), but I was looking forward to the time I was going to spend on the boat. The first thing I saw were beer glasses all over outside deck and they had been used as ash trays. This happened again on the return trip home, where there were even more "beer glass ash trays" around. Yuck. On the return trip I bought soup, goulash, which is the worst I have been served in my life. The bread roll that came with did not taste anything at all. And before eating this I searched all over the cafeteria for a chair without too many spots. Yuck. The toilets did not work. That is, one toilet was working, but there was no lock on the door. Yuck. Fortunately I had a cabin both on the outbound and on the return journey and for the most part I stayed in the cabin. Worn down boat. Seady decorations. Bad food. A disappointment. All in line with the expectations, maniacal organization even at the restaurant. "Story of the crossing Frederishavn Oslo"
It was a nice and peaceful journey, a ferry like a cruise ship. Toilets always clean, nice staff always ok, I travelled to Greece and Sadinia so many times, there is nothing to say with Stena Line, low prices, another world. 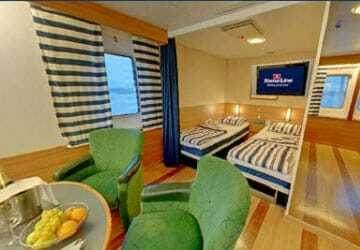 nice trip, excellent cabins, comfortable and clean. Breakfast was generous . The ferry fast and on time. Great crossing despite the waves because of the wind. Unfortunately, we left too late and therefore arrived later than planned. Furthermore, it was a satisfactory trip. 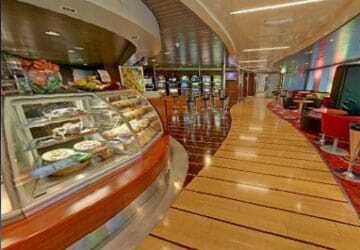 Tidy ship and friendly staff, buffet breakfast was delicious and we arrived on time. 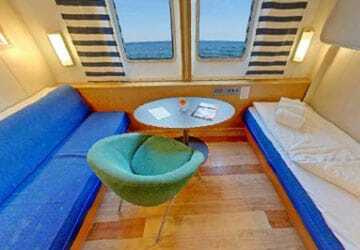 The cabin on deck 2 was small but clean (the cabins on this deck aren't suitable for passengers who suffer from claustrophobia). We had a very pleasant crossing. The price of the outside cabin was slightly higher, but well worth it. You have a view of what happens. "This One Goes to An 11 "
We made a roundtrip from Czech Republic to Norway and Sweden and back. We used a ferry from Frederikshavn to Oslo. Boat was nice and clean. It was windy a sunny day. First half of the trip was pretty boring but in the end when the cost started coming closer do our boat and we entered the fjord leading to Oslo, it was beautiful scenery. The ferry is pretty cheap for what you get.